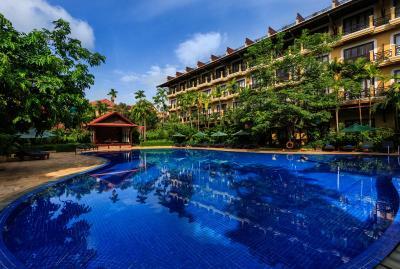 Lock in a great price for Angkor Paradise Hotel - rated 8.7 by recent guests. Breakfast was good, pool, sauna and steam room good, massage techs good. AC went out several times during the stay although not for extendrd periods. Staff was friendly although some with limited English. Breakfast food items not replaced after about 0830 so dont be late. We wanted to exchage thai baht for dollars at the hotel, they quoted us 40/1, actual rate is 30/1 so they make 25% on a simple exchange. Daugter bought some asian style free flowing pants at gift shop, first day out they ripped open under no stress as daughter is thin, gift shop refused to return money or offer exchage, do not purchase at the gift shop. Transportation just outside front door by way of tuk tuk main tourist area close by. Airport van pickup was nice. The staff were wonderful, very friendly and tried to please constantly. My husband became ill while staying and the efficiency of the staff in organising medical help was excellent. I will recommend it to others. Quality of the food in the restaurant. Location in the city. General appearance of the hotel. A wonderful hotel in a good location with excellent staff. We will come here again. Good facilities, convenient location (easy access to many local restaurants. night market, pub street, Made in Cambodia market), value for money, Central place to tourist attractions such as temples, floating villages, water falls. Staff were exceptional. Lovely pool area. Readily available tuk tuk drivers. Happy Hour! Location’s great. Breakfast spread is nice. Our tuktuk driver(Mr. Ryn) is really friendly and caring. Showcasing an outdoor pool and spa centre, Angkor Paradise Hotel is located in Siem Reap City Centre. Offering a sun terrace, guests can also enjoy a meal at the restaurant or a drink at the bar. 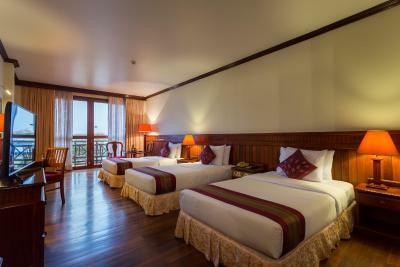 All rooms are equipped with wooden floor and flat-screen TV with satellite channels. Air conditioning, minibar and electric kettle are included in the rooms. Private bathroom has a shower, bathrobes, bathtub, hairdryer and free bath amenities. Guests can enjoy a cup of tea at the private balcony or terrace while admiring views of pool, garden and city after busy day. Angkor Paradise Hotel operates a 24-hour front desk that provides tour arrangements, luggage storage and a business centre. Complimentary one-way pickup services from the airport or bus station are available. 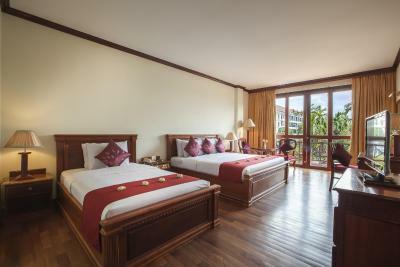 The resort-style Angkor Paradise Hotel is situated a 10-minute drive away from Siem Reap International Airport. It is just a few minutes walk from the Royal Residence, the National Museum, the lively Pub Street, the bustling Night Market and the famous Old Market (Phsar Chas). The UNESCO World Heritage Site of Angkor Wat Temple can be reached within a 15-minute drive from the property. Angkor Paradise Hotel has been welcoming Booking.com guests since 17 Mar 2010. When would you like to stay at Angkor Paradise Hotel? This air-conditioned triple room features a private balcony offering views of the city or swimming pool. Also includes a flat-screen satellite/cable TV, safe, tea/coffee maker and minibar. Private bathroom is equipped with a hairdryer, separate shower and bathtub. This spacious air-conditioned suite features a separate living room and bedroom with wooden flooring and large writing desk. Also includes 2 flat-screen satellite/cable TVs, safe, tea/coffee making facilities and minibar. Private bathroom is equipped with a spa bath, hairdryer, separate shower and bathtub. A complimentary newspaper is delivered daily. Spacious and well-appointed suite features a separate living, dining and kitchen facilities. Also includes a large, private bathroom with spa bath and separate shower facilities. Butler service is available. Fitted with wood flooring, this air-conditioned double room features a private balcony offering views of the city. Also includes a flat-screen satellite/cable TV, safe, tea/coffee maker and minibar. Private bathroom is equipped with a hairdryer, separate shower and bathtub. Fitted with wood flooring, this air-conditioned double room features a private balcony offering views of the pool. Also includes a flat-screen satellite/cable TV, safe, tea/coffee maker and minibar. Private bathroom is equipped with a hairdryer, separate shower and bathtub. Fitted with wood flooring, this air-conditioned twin room features a private balcony offering views of the pool. Also includes a flat-screen satellite/cable TV, safe, tea/coffee maker and minibar. Private bathroom is equipped with a hairdryer, separate shower and bathtub. Fitted with wood flooring, this air-conditioned twin room features a private balcony offering views of the city. Also includes a flat-screen satellite/cable TV, safe, tea/coffee maker and minibar. Private bathroom is equipped with a hairdryer, separate shower and bathtub. Fitted with wood flooring, this air-conditioned family room features a private balcony offering views of the city. Also includes a flat-screen satellite/cable TV, safe, tea/coffee maker and minibar. Private bathroom is equipped with a hairdryer, separate shower and bathtub. This air-conditioned connecting room features two private balconies offering views of the city. Also includes a flat-screen satellite/cable TV, safe, tea/coffee maker and minibar. Private bathroom is equipped with a hairdryer, separate shower and bathtub. 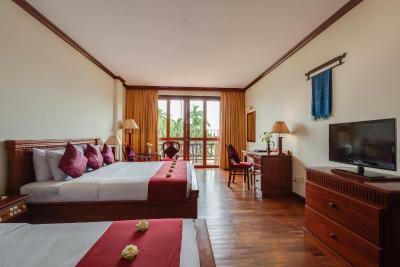 Angkor Paradise Hotel is situated a short distance away from Siem Reap International Airport and majestic Angkor Archaeological Park which include the famous temple of Angkor Wat and Bayon. The archeological site, a UNESCO World Heritage site that is the world's largest collection of religious temples and complex, is the ideal combination of culture and civilization that dates back to the era of the Khmer Empire. House rules Angkor Paradise Hotel takes special requests - add in the next step! Angkor Paradise Hotel accepts these cards and reserves the right to temporarily hold an amount prior to arrival. Please note that the property offers complimentary airport pickup services. Guests are to inform the hotel of their flight details in advance using the Special Requests box available. Guests receive a complimentary swimming pool towel daily. Please inform Angkor Paradise Hotel in advance of your expected arrival time. You can use the Special Requests box when booking, or contact the property directly with the contact details provided in your confirmation. No hot water in the shower. Internet was too slow and unreliable. I like the staff helpfulness. Floors were a little dusty in the rooms and shower was a little cold in the mornings. Fantastic location, good breakfast and comfortable. The staff were all fantastic and really made it an enjoyable stay.